The future just called: it wants its 3D toys back. Two cellphones released in South Africa in recent weeks offer a new glimpse of the future of 3D, and it looks like fun and games. Literally. 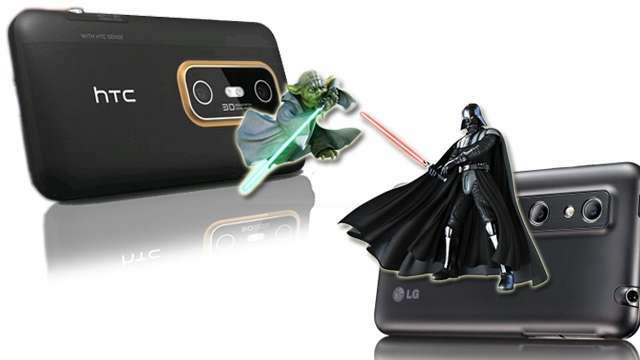 The LG Optimus 3D and the HTC Evo 3D sit at the cutting edge of mobile phone technology, but it’s a cutting edge that the market is not yet demanding. Their 3D functionality offers two major selling points: taking, making and viewing 3D images and videos, and playing 3D games. The big benefit they both punt is that the user doesn’t need 3D spectacles. By fitting the phones with two lenses on the back, they create stereoscopic images, a technique that is quite ancient. Previously they required special viewfinders, but normal human beings prefer not to have to change their own appearance simply to look at a still or moving image. For this reason, we are seeing a global push towards natural 3D, i.e. glasses-free viewing of 3D images. The concept is called auto stereoscopy, meaning that you automatically see the image in 3D if you view it from the appropriate angle. Nintendo first showed the world that it could be done convincingly on a handheld device with its 3DS gaming device. The 3DS doubles as a camera, and introduces Augmented Reality (AR) to the gaming arena. AR isn’t in itself a 3D technology, and is designed to overlay information, images or other content over a scene when viewed through an enabled camera or viewfinder. Combined with 3D, AR can be spectacular. A flat, dull surface can come alive with anything from soldiers to monsters to – and this is the scariest of the lot – commercial product offerings. In that context, the 3DS set the bar high for the next variation on the 3D theme, and LG and HTC were forced to push the edges of innovation on their new phones. The most surprising outcome is that the two phones are almost indistinguishable in feature range and specifications. Both sport dual 5 Megapixel cameras on the back, and the resultant images and videos are pretty much on a par. The difference lies in the software on the phone, and here the LG has the edge, with a 3D interface that gives the user a full 3D experience, rather than merely in games or applications. Its 3D zone also includes books, images, videos as well as games in 3D. The HTC makes up for it with the dazzling HTC Sense interface, which makes for quite magical normal use of the phone. For example, going from locked phone to camera ready in one swipe of the finger is more impressive than being able to explore the phone interface in 3D. The problem for both phones, however, is that once the novelty of 3D wears off, the phones will inevitably be compared to the top-of-the-range non-3D phones from other manufacturers. Both are rather bulky, in order to accommodate the dual cameras, and certainly don’t slip comfortably into a pocket. The rival manufacturers’ non-3D flagships, the Samsung Galaxy S II, the Motorola Razr, and the new Nokia Lumia phones as well as their current N9, are so easy on the pocket, they more than make up for the absence of a feature that the market has not been demanding. In future, all phones may well be 3D, but that is also a future in which all phones will respond to voice commands, all will double as high-speed WiFI hotspots, and all will have social networking and instant messaging as core functions on the phone. Playing Spiderman 3D on the HTC Evo or reading a genuinely pop-up version of Gulliver’s Travels on the LG Optimus belong to that future. They are amazing experiences, but once you’ve gone beyond the experience, you will want he phone to do what every other great phone can do. Like slipping into a pocket and barely leaving a trace.